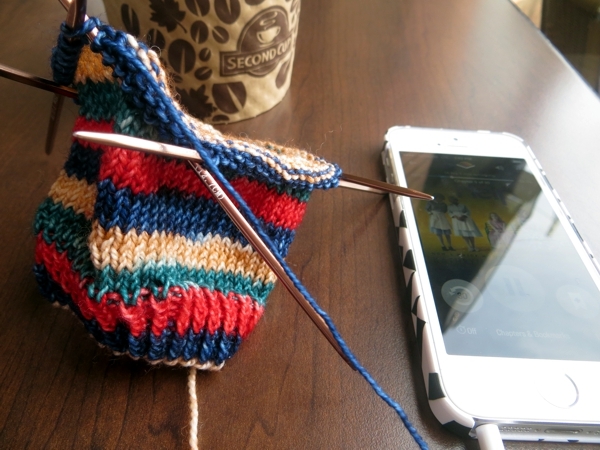 A couple of weekends ago I was in a coffee shop listening to The Help and knitting this sock. As usual, somebody stopped by to ask what I was knitting. So I said, as I usually do, A sock. And here's where it got weird. "Oh, I used to knit," the lady at my side told me. She was older, definitely retired, very sweet. "I used to knit the most beautiful sweaters. But I don't knit them any more." "No. I didn't need any more sweaters." I didn't know how to respond to this and she added, "I loved knitting." She looked so wistfully at my sock I had to stop myself from asking whether she might not know somebody else who could use a sweater, if that's all she wanted to knit. To deal with any bewilderment you might be feeling about the concept of knitting only for need and not because we Can. Not. 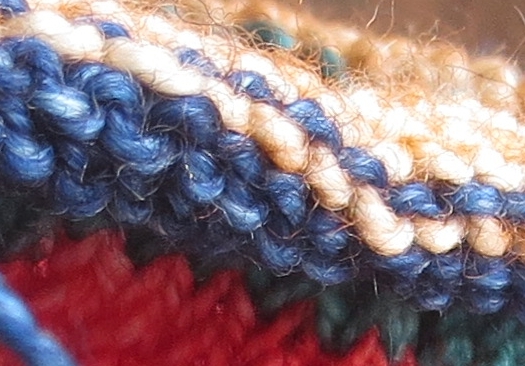 Stop., let's look at the sock stitches super close up so we can enjoy the halo of coloured wisps of wool. Feel better now? Okay then, go have a wonderful day and I'll see you tomorrow! I have had a couple of similar interactions. Sometimes I think it is because the person knitted because they "had to" and stopped when they didn't anymore. Yet, other times it's like what you just described. The knitter loved it, but when it was no longer a practical occupation they let society stop them. Why can we not craft simply because we love it?